Koolibri kirjastuse peatoimetaja Kadri Rahusaar on segaduses: tahaks olla igati seadusekuulekas, kuid reegleid on keeruline üheselt mõista. Could an Estonian child coloring a picture of Karlson drawn decades ago by Ilon Wikland in a coloring book really be dangerous? Dangerous enough to warrant a certificate before the coloring book published in Estonia can be sold? That is the question publishing house Tammeraamat asked itself when the Rahva Raamat bookstore returned its coloring books titled «Ilon Wiklandi pildid. Värvi ise!». The bookstore wrote that it regrets to inform the company that coloring books fall under the category of toys and must be certified in terms of safety for children. The same pictures of Karlson, Bullerby, and children of Troublemaker street published in an Astrid Lindgren book printed in the same printing house using the same ink are not dangerous, while a book of pictures without color and no text needs a certificate. Tiina Tammer from Tammeraamat said that she understands full well the law is there to be complied with. «However, we should refrain from absurdity,» she said. The publisher has not notified Ilon Wikland, who has for the first time allowed her world-famous originally black and white drawings to be used in a coloring book, of the complication yet. More so as the book was published in 2015 and had sold two-thirds of all copies by February this year. Nothing has happened to any of the children who have colored Karlson either at home or in kindergarten. Tammeraamat is a minor victim of a larger storm between bookstores and publishers and the consumer protection authority. Houses publishing books for small children that have clearly playful components (rattles, pencils, stickers etc.) are busy applying new warning labels on top of old ones. Editor-in-chief of publisher Koolibri Kadri Rahusaar lifts a pile of children's books by foreign authors onto the desk. Each one has a European CE marking of compliance with safety regulations and text to specify whether the book is suitable for children under the age of three. The publisher's warehouse employs five people who are busy sticking new labels on old ones. Stickers that say «warning» instead of «caution». The difference comes down to translation. The meaning of the warning is the same as Europe has had common rules for years, and Estonian publishers trusted the markings and labels of their partners in Europe. The Consumer Protection Board, that visited bookstores to inspect toys and children's books a few months ago, cannot fathom how publishers have been unaware of regulations for years. The agency said its control action only concerned a few books, and that the current panic is a case of overreaction by book sellers. Rahusaar shows a copy of the Estonian version of a rattling book meant for infants the warning label on which reads: not suitable for children under the age of three. «I must have overreacted in panic,» she says sarcastically. The association of Estonian publishers has met with the watchdog to discuss the situation and look for solutions. 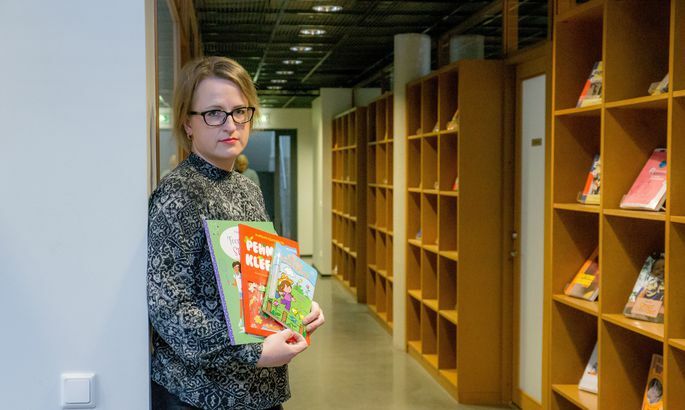 Head of the association Kaidi Urmet sent a letter the day before yesterday, asking the board to make requirements for children's books more legible and accurate. Publishers also want recommended guidance materials translated to Estonian. The board has promised to comply. «No publisher wants kids to meet with accidents, and we all want to obey the law,» Urmet said. Bookstores are missing a large number of so-called activity books for children that are being relabeled. It is pure loss for publishers in books not sold and the cost of new labels and man-hours to apply them. While the board claims Estonia observes the same rules European directives prescribe for other countries, publishers and bookstores say that is not strictly the case. «We agree that books need to be properly marked; however, we also want to avoid a situation where Estonian publishers and bookstores find themselves at a disadvantage because of local interpretation,» said sales director at Rahva Raamat Toomas Aasmäe. Rahusaar said that laying down the same requirements for children's books that include toys and simple coloring books could place in jeopardy the publication of coloring books by Estonian authors. The latter number few as it is: statistics from the National Library suggests that out of the total 153 children's coloring books published last year, only eight were believed to be originals. Not to mention original activity books. Estonia does not even have a laboratory where corresponding safety testing could be carried out. Ilon Wikland's coloring book will be allowed to return to shelves once the publisher gets certificates of ink and paper from the printing house (located in Estonia) and applies the CE marking. Only then will it be certain that a black and white Karlson does not pose a threat to the children of Estonia.